Tourist arrivals in Thailand were up during the first half of the year, according to the latest figures released by the Thailand Ministry of Tourism and Sports. Chinese tourists continue to come to the country in droves while Russian visitors are starting to return to the Land of Smiles after staying away in the aftermath of the ruble’s collapse. The ministry revealed that there were more than 19.5 million international tourist arrivals to Thailand during the first six months of this year. This is a rise of nearly 12 percent when compared with last year’s totals when there were only 17,465,861 international visits between January and July. The data showed that immigration recorded 2,946,286 international arrivals in June of this year which was an increase of more than 300,000 when compared with the arrival totals in 2015. 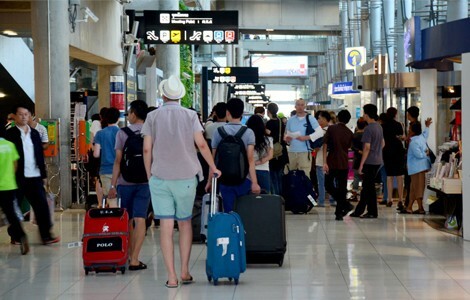 Arrivals from China continue to lead the way with nearly 5.8 million visitors from the country dropping by Thailand from January to July of this year. This is more than a 20 percent increase when compared with the same period last year when less than 4.8 million travellers from China visited the country. In a mildly surprising turn of events, Russian tourists have started to return to Thailand as the country continues to recover from its economic downturn in 2014. Nearly 600,000 Russian tourists visited Thailand between January and July of this year. This is a jump of almost 20 percent when compared with last year’s arrival totals from the same period. June and July were the strongest months for Russian visitors with arrivals growing 28.4 percent in June and 20 percent in July. Arrivals from Europe, including Russia, showed steady growth, according to the figures released by the ministry while visitor numbers from the USA and Canada increased 9.35 percent y-o-y. There was a 13 percent increase in arrivals from India and South Korea. Meanwhile, tourists from Australian and New Zealand continue to decline with total arrivals falling 1.6 percent when compared with 2015 totals.